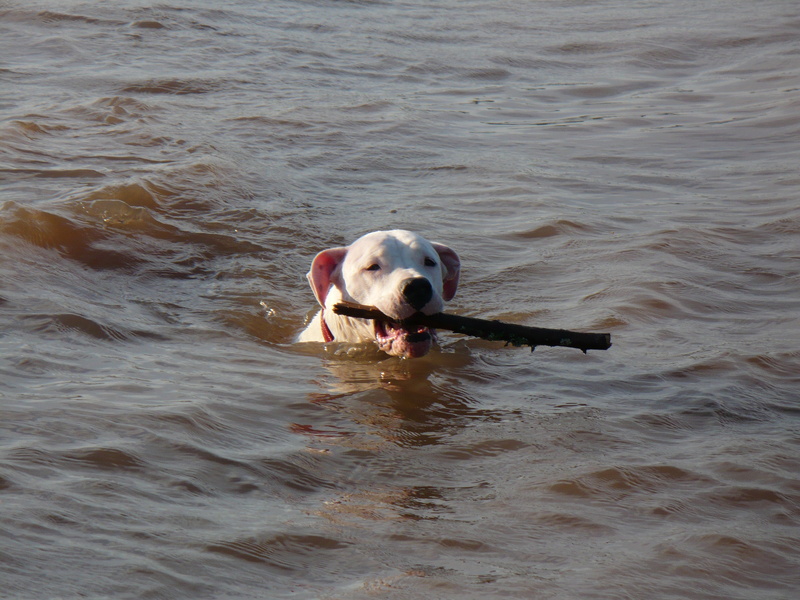 Corona loves to swim, especially if she has a stick to retrieve and it doesn’t matter the size. As long as this Dogo Argentino can see it she’ll get it again and again and again. Dogo Argentino’s are certainly known for their great amount of endurance and perseverance and Corona is no exception. We usually tire of throwing it before we see her slow down. But with balls Corona just doesn’t care unless there’s another dog who wants it. Although the water makes her stink it sure does slow her pacing at home! This entry was posted in Corona and tagged Argentine Dogo, Balls, Corona, Dog, Dogo Argentino, Dogo Argentino Breed, Endurance, Isaac'S Dog Run Park, Perseverance, PetMeds, PetSmart, Puppy on August 8, 2008 by CoronaTheDogo.